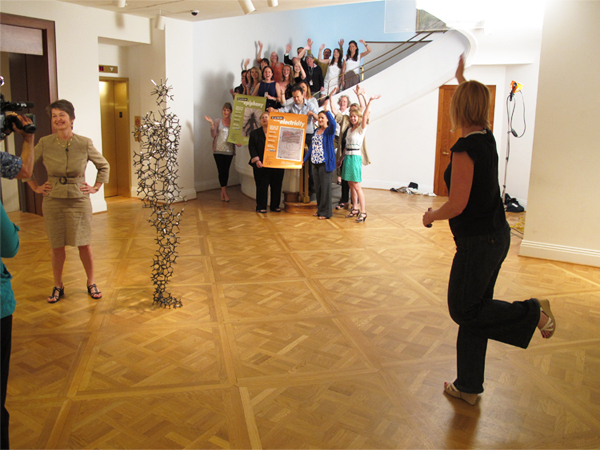 On Tuesday, my day began alongside dozens of our staff, beaming and dressed in their summer best, and Antony Gormley‘s personable Aperture XIII (2010) in a shoot for ABC7, WJLA-TV‘s “Good Morning Washington” program. Watch for our greeting starting next week, mornings between 4:30 and 7:30 am! This entry was posted in Director's Desk and tagged ABC7, Dorothy Kosinski, Good Morning Washington, WJLA. Bookmark the permalink.